German ophthalmologist; born at Fürstenberg, Silesia, July 25, 1839. Studied at Paris and Berlin (M.D. 1860). In 1860 he became privat-docent at Berlin, and was assistant at Liebreich's ophthalmological hospital in Paris from 1863 to 1869. In 1872 he became assistant professor at the University of Strasburg, where since 1877 he has been professor of ophthalmology. 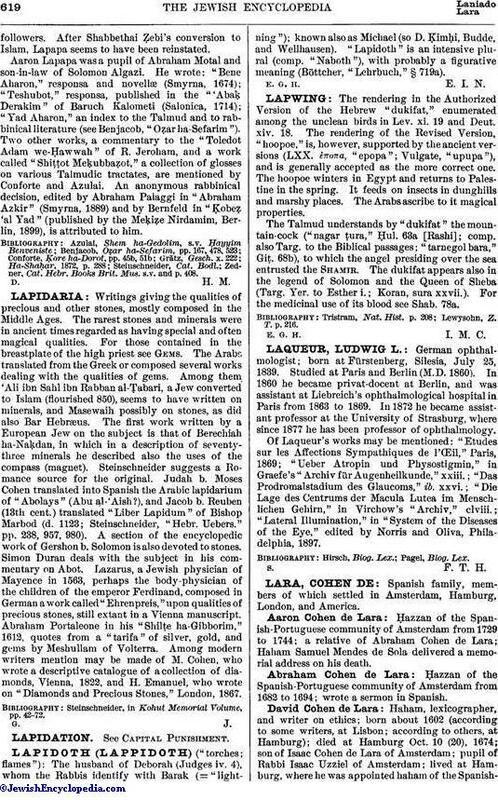 Of Laqueur's works may be mentioned: "Etudes sur les Affections Sympathiques de l'Œil," Paris, 1869; "Ueber Atropin und Physostigmin," in Graefe's "Archiv für Augenheilkunde," xxiii. ; "Das Prodromalstadium des Glaucoms," ib. xxvi. ; "Die Lage des Centrums der Macula Lutea im Menschlichen Gehirn," in Virchow's "Archiv," clviii. ; "Lateral Illumination," in "System of the Diseases of the Eye," edited by Norris and Oliva, Philadelphia, 1897.